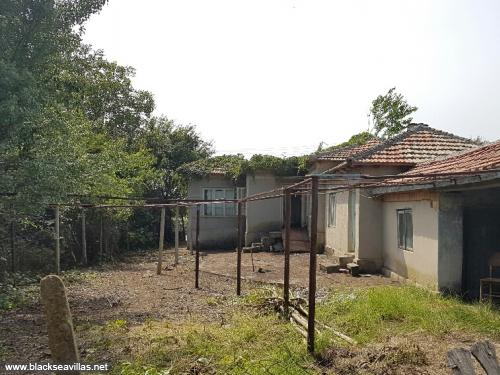 Here’s a chance to snap up building land with great potential, very close to the sought after north Bulgarian coast - the beautiful coastline that has resorts like Golden Sands, Albena, Balchik and others. It’s an area of good infrastructure and is a great place to holiday, retire or live permanently. Our team of property finders has unearthed this very interesting property - Field View cottage. Nestled in large grounds of 2,400 sq.m. (that’s well over half an acre), it’s a place that offers so much potential. The existence of a building on this land is a big advantage over buying a building plot. Firstly, it’s connected to mains electricity and water, so no need to pay the high connection costs that comes with developing a building plot. Secondly, the house itself is good sized, with a particularly impressive “summer kitchen” joined to the side, that offers potential additional accommodation. With the balmy Bulgarian weather, eating out in the dappled sunlight al fresco is very popular and many traditional houses have a kitchen and dining area partially open to the outside for this purpose. It’s easy to imagine sitting in a warm courtyard here, passing the time sipping low priced but good Bulgarian wine, complimented with high quality local cheeses and bread. This property as we show in the pictures is obviously in need of renovation – you’re not buying a new ready to move in to property. Leaks in one room have caused the ceiling to fall down. Whilst this looks a bit of a mess it isn’t in fact a massive job to put right. Just get low priced local labor to strip the tiles, felt and batten, then replace tiles and plasterboard the ceiling. The cottage has been modernized to an extent in the past as it has a water heater in the shower room. This will obviously need smartening up but the potential is there to make a lovely home. Or completely redevelop the site. Outside, there’s lots of land – 2400 sq.m. To the front of the house are support structures for vines. The rest of the extensive gardens are full of mature fruit trees. The land around offers privacy and space – plenty of room to spread your wings. Or realise a business idea – camping and caravanning anyone? Of course, the big plus of this property is its proximity to the wonderful Bulgarian coastline. Just 5 miles. Smin is a small yet beautiful village just 5kms to the sea. Nearby are located some of the most clean and least visited beaches on the Bulgarian Black Sea coast – hidden gems for you to discover. In the village there is a food shop and the infrastructure is well organized. The village is supplied with water and electricity and the roads are in a good condition. Full coverage of all mobile operators is available in the village. Regular public transportation, three times a day, connects the village to the town of Shabla and the nearby villages. Distance to Durankulak and the beach 8.6 km or 5.4 miles. And to Krapets resort and the beach, 10 km or 6.1 miles. Many other good quality resorts are along the coast. Varna international airport is 98 km away by good main coastal road. And not to forget Smin village is only a few miles to the Romanian border and easy access to the interesting coastal resorts there and Constanta airport which is 70 kms away and provides another option for flying to the cottage. Don’t expect to buy property this close to an up and coming holiday destination like Bulgaria’s north coast for peanuts. It’s the part of the coastline up-market Bulgarians prefer. Foreigners looking to buy in Bulgaria could expect to pay a lot more than the sale price for this house. In fact, from 20,000 Euros upwards. Anyone anywhere can buy, and you don’t even have to leave your home country if you’re short of time to visit us. A notary officer in your home town can do the paperwork. But if you do visit, our Manager, Martin, will welcome you warmly and do his best to assist you realize your aims with the property. We’ve offices on the coast in Balchik and have been serving clients from the UK and elsewhere since 2003. We’ve built up a comprehensive support network for home owners, from rental services to building works management. This is a property with immense potential, in a great location near the coast. Don’t miss out on this opportunity to put your money into a real and undervalued asset.